Should some cool-minded Martian come to earth and check on the state of our music, he might play through 10,000 jazz records before he found one that wasn't in common 4/4 time. Considering the emancipation of jazz in other ways, this is a sobering thought ... and an astonishing one. The New Orleans pioneers soon broke free of the tyranny imposed by the easy brass key of B-flat. Men like Coleman Hawkins brought a new chromaticism to jazz. Bird, Diz and Monk broadened its harmonic horizon. Duke Ellington gave it structure, and a wide palette of colors. Yet rhythmically, jazz has not progressed. Born within earshot of the street parade, and with the stirring songs of the Civil War still echoing through the South, jazz music was bounded by the left-right, left-right of marching feet. Dave Brubeck, pioneer already in so many other fields, is really the first to explore the uncharted seas of compound time. True, some musicians before him experimented with jazz in waltz time, notably Benny Carter and Max Roach. But Dave has gone further, finding still more exotic time signatures, and even laying one rhythm in counterpoint over another. The outcome of his experiments is this album. Basically it shows the blending of three cultures: the formalism of classical Western music, the freedom of jazz improvisation, and the often complex pulse of African folk music. Brubeck even uses, in the first number, a Turkish folk rhythm. Blue Rondo à la Turk plunges straight into the most jazz-remote time signature, 9/8 - grouped not in the usual from (3-3-3) but in 2-2-2-3. When the gusty opening section gives way to a more familiar jazz beat, the three eighth-notes have become equivalent to one quarter-note, and an alternating 9/8 - 4/4 time leads to a fine solo by Paul Desmond. Dave Brubeck follows, with a characteristically neat transition into the heavy block chords which are a familiar facet of his style, and before long "Rondo à la Turk" is a stamping, shouting blues. Later the tension is dropped deliberately for Paul Desmond's re-entry, and for the alternate double-bars of 9- and 4- time which herald the returning theme. The whole piece is in classical rondo form. Strange Meadow Lark opens with Dave Brubeck playing rubato, though there are overtones of 3's and 4's, and the phrase length is an unusual 10 bars. 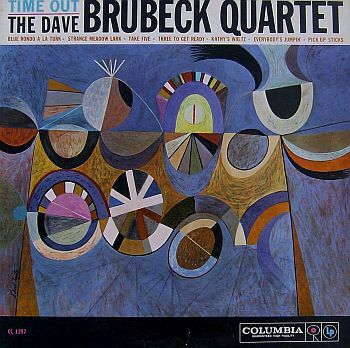 Dave Brubeck's performance throughout is simple and expressive, with fine support from Eugene Wright and Joe Morello .Strange Meadow Lark closes with a contribution from the wistful, dream-like saxophone of Paul Desmond. Take Five is a Paul Desmond composition in 5/4, one of the most defiant time-signatures in all music, for performer and listener alike. Conscious of how easy the listener can lose their way in a quintuple rhythm, Dave Brubeck plays a constant vamp figure throughout, maintaining it even under Joe Morello's drum solo. It is interesting to notice how Joe Morello gradually releases himself from the rigidity of the 5/4 pulse, creating intricate and often startling counter-patterns over the piano figure. And contrary to any normal expectation - perhaps even the composer's! - Take Five really swings. Three To Get Ready promises, at first hearing, to be a simple 'Haydn-esque' waltz theme in C major. But before long it begins to vacillate between 3- and 4- time, and the pattern become clear: two bars of 3, followed by two bars of 4. It is a metrical scheme which suits Dave Brubeck down to the ground; his solo here is one of the high spots. Kathy's Waltz (dedicated to Dave Brubeck's little daughter) starts in 4, only later breaking into quick waltz time. As in the Disney-born "Someday My Prince Will Come", Dave Brubeck starts in triple time, then urges his piano into a rocking slow 4. Theoretically it is as if Joe Morello's three beats had ceased to be the basic pulse, and had become triplets in a slow 4-beat blues -- though with Eugene Wright's 1-in-a-bar bass as the constant link between piano and drums. The listener who keeps abreast of the cross-rhythms here can congratulate themself on sharing with the Brubeck Quartet an enlightened rhythmic sense. Even feet are useless in following a time experiment of such complexity. Everybody's Jumpin' opens without any precise feeling of key, but with a vague impression of 6/4 time, and a strong beat. Joe Morello's brief drum solo shows again what a superb colourist he is on the canvas of percussion tone. With Pick Up Sticks, the earlier hint of 6/4 becomes positive. As so often in Dave Brubeck's time experiments, it is the bass part which supplies the anchor for the listener. This time Eugene Wright plays a regular pattern of six notes: a passacaglia on which is built the whole structure of this closing number. The high spot of "Pick Up Sticks" comes near the close, in a session of commanding piano. This is Dave Brubeck in the grand manner, as exciting as eight brass, but with that feeling of urgent discovery which can never be captured by the arranger's pen. In short: "Time Out" is a first experiment with time, which may well come to be regarded as more than an arrow pointing to the future. Something great has been attempted...and achieved. The very first arrow has found its mark.